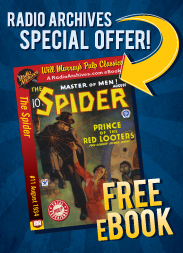 Tough guys with hot gats meet cool dames with swell gams, as they traverse the dark side of life in this amazing collection of murderous gangsters, hard boiled detectives, dangerous gun molls, and wisecracking cops. 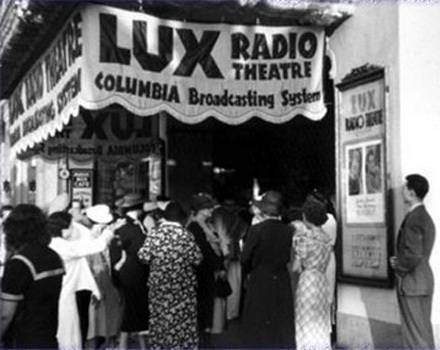 Listen to your favorite films on the Lux Radio Theatre as you’ve never heard them before. The sound quality is truly sensational, and the stories are even more so. Once again you’ll hear radio adaptations of Hollywood films sometimes starring actors recreating their original roles, and sometimes with different stars taking a crack at them. It’s a fascinating “what if” situation come to life. You’ll hear Ray Milland playing pro-tennis player, Guy Haines and Frank Lovejoy as the murderous Bruno Anthony in Alfred Hitchcock’s Strangers on a Train (in the roles originally played by Farley Granger and Robert Walker). You’ll also hear these original stars recreating their famous roles: John Garfield is back in Dust Be My Destiny. William Powell and Myrna Loy are the irrepressible Nick and Nora Charles in The Thin Man, and they also recreate their roles in Manhattan Melodrama, Don Ameche fills in for Clark Gable in that one. Edward G. Robinson is back, along with Humphrey Bogart in Bullets or Ballots. Dorothy Lamour and Edward Arnold are back in an adaptation of Johnny Apollo, and James Cagney and Pat O’Brien reprise their roles as Rocky Sullivan and Father Jerry in the wonderful Angels With Dirty Faces (with Frank Nelson in Bogart’s original role!). But the most interesting show for my money features Edward G. Robinson as detective Sam Spade in The Maltese Falcon, co-starring Gail Patrick and the supremely talented Laird Cregar as Casper Gutman. Dan Dailey and Dorothy McGuire take on the roles created by Joseph Cotten and Jean Peters in A Blueprint for Murder. And fans of I Love Lucy will get a kick out of hearing Lucille Ball play it straight in her original role in the classic film noir, The Dark Corner, co-starring Mark Stevens, who was also in the original film. So be sure to call your mouthpiece so you can get sprung from the big house in time to hear this truly terrific collection. It’s Hollywood as you never heard it before. Nick Santa Maria, a published film historian and author is the Project Producer for this series. With Cecil B. deMille hosting the majority of the earlier LUX Programs, and with a big budget with the most popular Actors and Actresses of the time still well remembered to this day, writers and an all around team, it is no wonder this is one of the best remembered shows from the Golden Age of Radio coming direct to you FROM HOLLYWOOD. Olivia de Havilland is in one of these shows, and Miss de Havilland is still with us, living in Paris, France and around 100 years old. The Radio Archives staff have produced what is considered the best restoration of these programs known to exist today. They are to be commended for the excellence of the work in restoring these radio shows back to a quality that what probably not even heard when initially broadcast on the air. Each Volume comes in a heavy duty plastic box with individual plastic sleeves for added protection. The front artwork on each Volume is also most interesting, and can change from time to time.